The Cleveland Cavaliers spread kerosene, lit a match and blew up about half of their roster yesterday. They essentially gave themselves a mulligan on their entire 2017 off-season in the process. Gone are both players that were acquired in the mega trade of Kyrie Irving to the Celtics. Isaiah Thomas is a Laker (for the moment?) and Jae Crowder is a member of the Utah Jazz. Dwyane Wade has been shipped back to Miami, Channing Frye has been cast off to Tinseltown with Thomas and Iman Shupert and Derrick Rose was given a one-way ticket to Sac-town (for now). In return the Cavaliers got younger and more athletic, but didn’t address their biggest need of all, rim protection. The most ironic (or is it?) part of the Cavaliers trade with the Lakers is that in taking Clarkson’s $12.5 million and Larry Nace Jr’s $2.7 million off the books next season and giving the Lakers two expiring contracts in Thomas and Frye, the Cavaliers actually helped the Lakers be able to afford two max contracts this summer to pursue LeBron James and Paul George. You know the Cavaliers front office had to be aware of that before making the trade which can mean one of two things on the surface (feel free to insert your conspiracy theory here) either they are assured LeBron James will not sign with the Lakers and are confident these moves will help convince him to return or Gilbert and LeBron’s relationship is so bad that Gilbert doesn’t care anymore and is trying to push him out. Looking at the actual deal it is clear the Cavaliers are much younger and more athletic, but have a huge hole in the front court, especially at the moment with Love’s injury. Hill is absolutely a far better point guard option alongside LeBron with his length, ability to defend a 1 or a 2 and his proven ability in the past to be a good catch-and-shoot guy. Hood may be tasked with defending elite wing players around the league, which he has shown little ability to do at this point in his career, but as an athletic 6’8″ wing player who shoots 40% from three, he is a valuable asset for Cleveland as well. Jordan Clarkson is the most interesting piece for the Cavaliers as they clearly value his combo guard and scoring ability and are willing to take on the additional years and money associated with his contract. He is the kind of player who could potentially bloom into a borderline All-Star if LeBron does stick around, akin to Mo Williams in the past. Larry Nance Jr. is another young, long and freakishly athletic big guy who can run the break and get easy dunk opportunities around LeBron. He is not a long-range shooter like Channing Frye or Kevin Love though and he may struggle to find his role on the team. He will be counted upon a lot in the next month or so with Love out and a huge hole at the power forward position. I think Cleveland improved, but they failed to get the two things they may have needed most: a lockdown wing defender who could guard a 2, 3 or 4 and a true rim protecting center who can bang in the paint. Acquiring DeAndre Jordan and a player like Kent Bazemore would have met those standards, but they were unwilling to part with the Brooklyn pick in the 2018 draft. 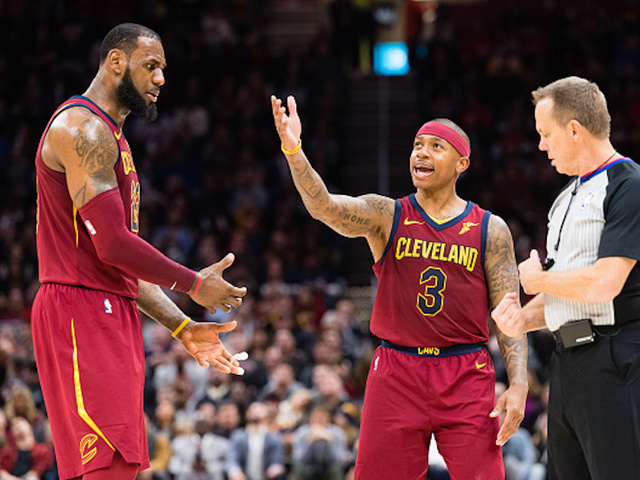 The Cavaliers will look completely different the last few months of the season, will it help them get their mojo back? I have no idea.